If the socialist government is returned to power your vote today may be the last free individual vote you will ever be given the opportunity to exercise in New Zealand. When is the Government going to get this message: democracy is not a device to keep the Labour Party in power. tane hope you don’t mind, i pasted this from kiwiblog – thought you might be getting a bit lonely here at hte Very Double Standard! Inventory I do not think immodesty is necessary. I also wonder if the fact that we were having a right go at the media last week has anything to do with the slow but definite turnaround. Regrdless of our political persuasion – we have tried many tactics and contacted many people about this issue – all in the face of a government that firmly wanted their agenda kept under wraps. ‘There’s nothing to see, move on’. We have been subjected to taunts by it supporters tnat the ‘people’ and ‘the media’ are not interested in our ‘hyperbole’. We’ve had pompous a**holes who appear to believe they are able to receive telepathic messages from the Government telling us our concern is pointless, therefore redundant. We’ve had ‘It’s a beltway issue.’ rubbed in our faces, and have been accused of wanting to kill the Bill because we are National Party sock-puppets who are only out to ‘rort the election’ – ie we are dishonest and corrupt, when we are merely concerned citizens trying to preserve our rights. We’ve listened to the scratched record claims tht the Bill is designed to stamp out the kind of machinations the EB underwent, but have seen that is BS, and and by implication, Key has been defamed as being party to it and to the next attempt. Our recognition of the bad drafting, the ill-conceived advice from Val Sim, the recommendatios of the Law Society and the Human Rights Council, have been belittled as ‘tin-foil hat paranoia’, and as well, those who have criticised us have done so under the pretence that our response has been unworthy of serious debate. We have been called ‘Hollow Men’, by people who resemble nothing more than a cracked drum. So, do not be immodest, my old china, what we have done lately has been superb and maybe difference between us being able to hold our heads up high, and skulking in corners in the coming months. 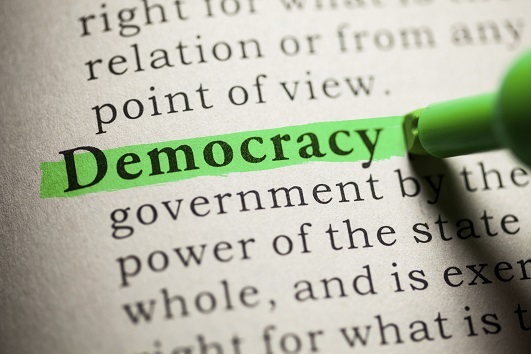 The EFB is all ABOUT Democracy. The day that a political party can buy its way into office is the day we lose it. illumiatedtiger, wtf? The EFB is all about regulating everyone’s speech. As for buying one’s way into office, does $800k knicked from the taxpayer by Labour, or $15m on WFF – “you’re better off with Labour” again funded by the taxpayer evidence the fact that Labour did indeed buy its way into office and we lost democracy in 2005? Yes, the average working Joe with hundreds of thousands of dollars to campaign with is going to have their ability to do so severely restricted. I personally am shocked that the $600,000 I found down the back of the couch and was planning to spend on promoting the concept of a Citizens’ Daily Alcohol Requirements and Beer Fridge Subsidy would be ruled out of order by this bill – it’s fascism is what it is! So, Milt, how would you explain ACT’s failure to get many votes despite spending millions on election campaigns? Cos their policies are so damn unpalatable to the public that they needed to spend millions of dollars and focus their election advertising mainly on crime and other non-core issues just to get above 5%? Perhaps its time to apply some kind of godwins law to kiwiblog. Farrars law, every thread that isn’t about the EFB (which admittidly isnt many), the first poster to post the letters EFB automatically looses. I guess this quote just shows again that after three terms of very modest Social Democratic progress, the forces of the political and economic Right have decided that Labour and allies have been a little too successful at making life fairer for ordinary people. It would not be hard to imagine an ongoing series of smears and outrageous attacks, seeking (as Matthew Hooton did on Monday morning on Nine to Noon) to portray the government as a reheated Muldoonist administration. After all, the right seem to have worked out they can’t win any more on their merits. I suppose they think trying lying and distortion instead is the next best option! Jordan – I’m just interested to know when the Right could ever win on its merits? It certainly sounds as if the 1930s were no different? Perhaps you are speaking of Ancient Greece? I know the Nats Front Bench is old, but not that old surely? Yup, socialism was as much a threat to freedom in 1938 as it is today. And yet, strangely, those ordinary people have not conferred a majority of support on that wonderful party in any opinion poll in the last 18 months. Ungrateful swine! At the risk of going off-topic, when is National going to put out some policy? Oh and I notice that JK is now saying the Nat’s are totally against the EFB (directly contradicting big Ger). I’m assuming this’ll be another bait and switch number. It says a lot about how extremist the right in New Zealand is – and has been – that they regard a strong, well led moderate social democratic government with hysterical loathing. Most of the right wing people who put it about on the web are simplistic neo-liberal half wits; But they do represent only a slightly more virulent strain of the sort of mysogynistic, racist and Hobbesian world view found in far to many of our board rooms. Its a very, very sad statement on the quality of our business elites. Yes, that’s right. Whenever the public are unanimously opposed to Government action, and a newspaper comes out on the side of the public, it’s a massive conspiracy by the Right. Parrot, National’s front bench is several years younger than Labour’s. Prick, you’re in a dreamworld. Before yesterday the public had no idea about the EFB. Even now, I’d say most people don’t know what it is. Some will have been scared by the Herald’s fear campaign, but you can hardly claim there’s been some kind of massive grassroots rebellion against fairer electoral law. Go on, Tane. Keep telling yourself that it’s a beltway issue, and see your polling numbers go into free-fall. After the pledge card theft, I would have thought that Labour’s arrogance might have dissipated. But no: instead you’re quite happy for Labour to rail-road through the biggest constitutional change in recent history to suit itself, at the expense of everybody else. And you blithely believe the public will let you get away with it. I really don’t believe you will come to terms with how serious this is until long after the fact, Tane. But you’ve become a hollow man. Prick, I haven’t said it’s going to remain a beltway issue. Clearly if the country’s largest daily is mounting a heavy campaign to make it an issue then it has the potential to become one. My point is that it’s a beatup, not a genuine grassroots revolt as you’re suggesting. And honestly bro, that hollow man stuff’s just stupid. I mean, I can see what you’re trying to do – take a term the left uses against the Tories and use it against us – but you’re just a bit amateur in your execution. I guess that’s to be expected when you take your lines from Davey Farrar. IP – “a hollow man”. I’ve noticed you’re using this a lot today – it’s like you think it’s clever and so you’re saying it as much as you can. Unfortunately like you attempts at wit your political analysis misses the mark and is repetitive. While the Herald article is not a bad coup – it won’t take this past the beltway because it’s only punters like you who are stupid enough to drive it. The truth is anyone with any political savvy will steer clear of getting involved in this fiasco because it’s a complicated issue that can’t be reduced to soundbites and, more importantly, it’s an issue that involves a huge mess of vested interests from across the political spectrum and anyone who really pushes to get their position on the record runs the risk of painting themselves into a corner when it comes to the final vote and/or having their own interests in manipulation of the law outed. Tell the seven hundred people who have written emails to the Herald in the last day about the constitutional travesty that is the electoral finance bill, that it’s a beltway issue. You’ve become too accustomed to power, Robinsod. You’re now taking New Zealand voters for granted. Watch your numbers go into freefall. You’re a hollow man, and you can’t even justify this shoddy piece of legislation. I think you got him with that one Prick, well done. And it’s no surprise 700 people have written to the Herald. If they ran a front page scare saying “Helen Clark eats puppies” (preferably with a big picture of a puppy being eaten) they’d get 700 letters on that one too. Yeah bro that’d be all that power I wield by commenting on blogs. Get a grip IP – and get back to work. Robinsod, I hate to point it out, but “bro” should have an apostrophe on the end of it. I am not normally that much of a pedant, but I know it’s important to you. Billy, you obviously ain’t street. It’s okay, I know it’s hard making the transition from Kiwiblog, but you’ll get there bro. Oh and Billy – stay on topic. Well done, Robinsod. Another fine example of you demonstrating your chops as “a pitbull of the left with a hang-up for correct grammar and spelling”. I should have known you would be unable to resist an opportunity to “rip… into every Tory [you] can find”. Billy – are you like being a groupie? Mint, I’ve never had one before. Are you like, a chick? Yes, Robinsod. That’s it. I am being a groupie. And I am a chick. A really hot one. Like a young Sophia Loren, only hotter. And more left wing. There is no limit to your self-delusion. Really? Like a young Sophia Loren??? D’ya think we could like uh, hook up some time Billie? And do you like put out on the first date? You don’t want to do left wing chicks, Robinsod. We always have to consult for hours in University common rooms before coming up with approved positions.